The Harmony Hotel is one of the most recent jewels of Mykonos island, an exclusive hotel that portrays authentic Mykonian architecture. With a combination of balanced colors and traditional style it results in a harmonious setting of impeccable beauty that creates a relaxing atmosphere. Privileged with respect to its location, the A' class Harmony hotel is situated in Mykonos Town just by its port, about 3km from the airport with the nearest beach being about 400 meters away. Each room has its own distinctive and stylish decoration that is combined with local architecture. Rooms offer various facilities some of which are air-condition, satellite-TV, mini bar, safe box, direct-dial phone, room service, modem port, heating, hairdryer, and Jacuzzi for the Junior Suites. Room balconies offer magnificent view of Mykonos town and the Aegean Sea allowing guests to enjoy the beauty of the Mykonian sunset. Sited in the heart of Mykonos town, just by its port, the Harmony hotel is the ideal place to enjoy the legendary and cosmopolitan aura of Mykonos. Hotel personnel are willing to offer services of high standards in a warm and professional manner that reflects the Mykonian hospitality. 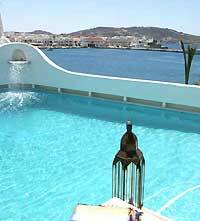 Guests can enjoy the swimming pool with its outstanding view of Mykonos town while drinking a cocktail from the pool bar. For dinner, try the gourmet restaurant where guests can taste some delicious dishes and enjoy the seducing view of the Aegean sea. After, you can have a drink at the lounge bar.